Internationally renowned poet and entrepreneur, Annie Finch, announces the launch of Halloween Kickstarter campaign for Spells herbal tea, designed for the witch in every woman. 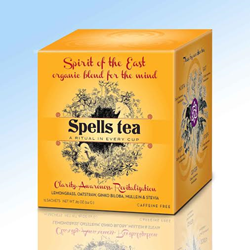 Spells Tea - designed for the witch in every woman. Poet and entrepreneur Annie Finch, known widely for her writings about witchcraft and paganism, is launching a Halloween Kickstarter campaign to start on October 2 and end on Oct 31, 2014. The goal of the campaign is to raise $39,000 to help launch Finch’s new line of herbal teas, Spells Tea. Donations will help to cover business startup costs including, growing, harvesting, blending, and packing the tea as well as website development for Spells Tea’s parent company, The American Witch Community & Marketplace. Finch, who lives in the Portland, Maine, area, known for its locally sourced food, has collaborated closely with Maine artisan herbalist Marissa Caminiti to develop five original tea blends inspired by the five directions of the Wiccan sacred circle. Most of the herbs for the teas, including lemon balm, lavender, chamomile, and oatstraw, will be foraged, farmed, and hand-packed by farmer Rhonda LaPierre on her small family farm in central Maine. Finch, an internationally renowned poet and Huffington Post spiritual columnist, says that Spells Tea, like The American Witch Community & Marketplace, aims “to inspire and nurture the witch in every woman.” AmericanWitch.com plans to offer resources, blogs, podcasts, and community networking about contemporary paganism and witchcraft. Lifestyle items including stationary, candles, cosmetics, jewelry, housewares, apparel, and goddess art as well as Spells brand tea, chocolate, and coffee will be available in the Marketplace. Many of the items, including each box of Spells Tea, will include Finch’s inspirational poetry. Continuing the theme of women’s spirituality, each teabag label will include a goddess from cultures around the world. “Halloween is the perfect time of year, and 2014 is the perfect year, to launch Spells Tea. A witch is a woman of power, and every witch needs her spells! Now is the moment for women to connect with ourselves, the earth, and each other. That’s what Spells Tea is about. For centuries, women have found strength in their connection with herbs and plants. Now, we are beyond excited about our mission of bringing women around the globe together to reclaim our female power with the help of the beautiful, joyous, and time-honored traditions of earth-centered and women-centered spirituality,” says Finch. The Kickstarter campaign will start on October 2 and run to Oct 31. The Kickstarter closing date is significant for three reasons: it’s Halloween; it’s the traditional Wiccan New Year, when most witches consider that the earth-based calendar year begins; and October 31 is also Annie Finch’s birthday. Annie Finch is an award-winning poet and an author, performer, spiritual writer, and entrepreneur. Her poetry has appeared in The Penguin Book of Twentieth-Century American Poetry and onstage at Carnegie Hall. Educated at Yale and with a Ph.D. from Stanford, she has taught poetry at numerous universities. She writes regularly on spirituality for The Huffington Post and is founder and CEO of The American Witch Community & Marketplace. For more information about Annie Finch, please visit http://www.anniefinch.com.